A week after arriving in Trinidad, it was back to the airport to do the short flight across to Tobago. The flight is only 17 minutes, which was a bit of a novelty. The second week of the trip was to be spent here, with a view to it being a slightly calmer week with more time for touristy/relaxing things. We met with our guide for the week, Peter Cox, to have a quick chat about the week and map out a basic plan. A quick wander around Crown Point and a paddle in the sea, then it was to bed to wake up early the next morning and meet Peter. The next morning we met the others and headed up into the forest. We had heard the Trinidad Motmot was easier to see in Tobago, but we were still surprised to see one just sitting at the edge of the road and took the opportunity to get a great look and some photos. Our first stop was in the small village of Moriah, where we saw a Ruby Topaz and also a nest with a baby Black-throated Mango. Amazing! We also had our first encounter with the other kind of Grassquit that lives on Tobago, the Black-faced Grassquit. On to Castara, where we stopped at the edge of a river to see our first Green Heron. As we were watching it, a pair of Red-crowned Woodpecker flew in and landed on a tree nearby, giving us a great view. The bulk of the day was spent on the Main Ridge in the rainforest. Red-legged Honeycreeper are a lot more prolific in Tobago and we were seeing lots of them around. Within 5 minutes of being in the rainforest we had come across the infmaous White-tailed Sabrewing and we were to have many more encounters with them throughout the week, an especially good one being a pair fighting a mere foot over Stuart's head. Another Tobago species is the Blue-backed Manakin and we had a few glimpses of these lovely coloured birds. We also were lucky enough to quickly add the Olivaceous Woodcreeper to our list, a species not present on Trinidad. Heading out of the rainforest we had two more new species, a Great Black Hawk and a Venezuelan Flycatcher. That evening Stuart and I did a little birding by ourselves in the Bon Accord area. We added some species to our list here including Common Gallinule, White-cheeked Pintail, Black-bellied Whistling Duck and Tricoloured Heron. We spotted a couple of birds we didn't know and discovered from the book that they were both Fuscous Flycatcher and Brown-crested Flycatcher. Stuart was disappointed as he was hoping to turn one of them into the elusive Mangrove Cuckoo, a bird that had been allocated at least half a day to find! As we drove out of the area, I asked to stop to have a quick look at a bird I had spotted across the grassy area. Upon looking through the binoculars I realised it had a long stripey tail and was suspiciously cuckoo like. I yelled at Stuart to come over and look but the bird took off. Luckily, it flew straight at us, then landed in the tree behind and it was indeed a very sweet Mangrove Cuckoo! We also first noticed here that the Spectacled Thrush seemed to have larger eye rings than on Trinidad but I can't find any literature about it on the internet. If anyone has any information, please let me know. The Magdalena Grand was our first stop the next day, the old Hilton Hotel site. This has many pools and is great for all sorts of herons and supposedly waders, although we didn't see any here! Plenty of Green and Tricoloured Heron were always here, with the occasional Great White Egret and Little Blue Heron. We also saw our only Black-crowned Night Heron here, a juvenile unexpectedly sitting on the side of a pool. Behind the same pool I spotted a few large black birds I didn't think we'd seen before and upon further inspection, these turned out to be Giant Cowbird, a species we'd missed in Trinidad. Another surprise was a large heron flying in, a Great Blue Heron. Further round there were some overgrown pools where the Masked Duck had been seen. Unfortunately they weren't here when we arrived and didn't show their masked faces at any part of the afternoon. However, there were baby Cattle Egret chicks and Little Blue Heron chicks, so that made up for it. We saw a small flock of Least Grebe and incredible views of a Ruby Topaz, with it coming down to 2 foot away. We followed the call of a White-fringed Antwren for a good half an hour before it decided to give us a fleeting glimpse and then we were off to Buccoo Marsh. Upon arriving at Buccoo Marsh, we promptly got lost and wandered in circles in very sticky mud for quite a while. Eventually we got onto the right path and had great views of the very same bird we'd stalked for ages earlier, the White-fringed Antwren. There was also another new bird for us, a Scrub Greenlet. Although we had seen the Yellow-breasted Flycatcher on Trinidad, there were three in the Marsh playing around and taking absolutely no notice of us and they were an absolute delight to stop and watch. Tiny little bright yellow things. We headed across to the island of Little Tobago on the Sunday, to try and get a few more species that were local to there. On the boat across we saw Brown Booby and once landed, a Broad-winged Hawk. On the way up to the viewpoint, we stopped off at an abandoned house and the boatman told us to go up and have a look in one of the rooms. I did and there was an incredible number of bats roosting in there, which made me very happy! One flew out just past my face and I nearly hyperventilated from excitement. I think I may love bats a little too much. From the viewpoint, we saw the incredible Red-billed Tropicbird almost straight away. There were also Red-footed Booby, Sooty Tern and Bridled Tern and I watched a Scaly-naped Pigeon fly along the cliff. On the way back to the boat I spotted a bird I didn't recognise and the boatman had no idea what it was and got quite excited. Once we got back to the mainland, it was IDed from the photos I had taken as a Yellow-billed Cuckoo, not particularly rare as they do come to the islands but it was very early apparently. A short trip to the Main Ridge again the next day gave us Plain Antvireo and the one we thought we would miss, the small White-throated Spadebill. We had some more good looks at the Blue-backed Manakin and were lucky enough to see another Olivaceous Woodcreeper. A quick pop in to Magdalena (as we had been doing every afternoon!) finally proved fruitful as one of the Masked Duck must have known it would be our last visit and was kindly out on one of the pools. We also had a quick drop in at Bon Accord, where we found a Little Egret. 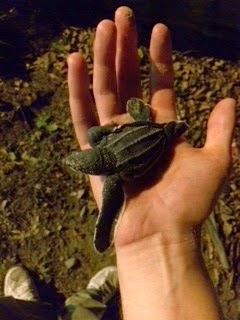 That night we joined Peter on a patrol of Stonehaven Beach to see if there were any turtles coming in to lay eggs. We had heard that they had only seen one or two over the past few nights, mainly after midnight, so we didn't expect to see anything. However, within half an hour of starting the patrol, we came across little movements in the sand and then we realised there were loads of them - leatherback hatchlings! Unfortunately they were nearly all headed towards the street lights and the road, in the opposite direction to the sea. We quickly started gathering them and taking them back to the sea. We must have gathered about 60 in the end, with one even being found having made its way right up the embankment, across the road and down into a drainage channel! It was an incredible experience and something I'd like to go back and help with again. It was added to about twenty minutes later when we spotted a fully grown pregnant female lumbering up the beach, finding her spot, digging out the nest and then laying eggs. An amazing night. Trinidad and Tobago was an excellent introduction to world birding and with such a high concentration of birds, somewhere I'd definitely recommend. Yes what you said is true, with out the ecosystem in place, we are bound to have problem sooner or later.